The Senate majority whip said at a closed-door session that the prospect of the Senate voting on Brett Kavanaugh's nomination close to Election Day 'scares the living daylights out of' Democrats. WASHINGTON — Democrats are "sick to their stomach" and have had the "living daylights" scared out of them by the threat of Republicans' holding the Senate in session until Election Day to finish the confirmation of Supreme Court nominee Brett Kavanaugh, Senate Majority Whip John Cornyn said at an annual summer meeting of the Koch political network in Colorado Springs, Colorado, over the weekend. Cornyn, who was participating in a closed-door question-and-answer session, said he wants to hold the final vote before the Oct. 1 start of the next session of the high court — to "get her done" — but suggested he won't be upset if that date "slips a little," according to a person who attended the discussion. The explicit reason for a slower process is the potential political gain for Republicans in rallying their base, and denying Democrats valuable time on the campaign trail. But Cornyn rejected the idea that it would be better for the GOP to hold the nomination up until after Election Day to make sure Republican voters are energized. 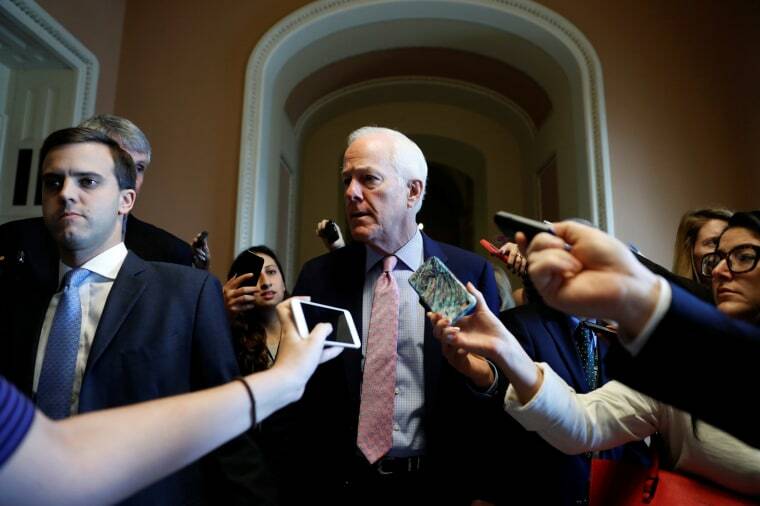 Instead, Cornyn said, Democrats are on their heels because of Majority Leader Mitch McConnell's threat to keep the Senate operating right up until the election, if necessary, to confirm Kavanaugh and other judges. "For those senators running in red states who are Democrats, that scares the living daylights out of them," he said, according to the attendee. "They’re already sick to their stomach because he canceled the August recess so they can’t be out raising money or campaigning." But delaying action on Kavanaugh until after the November midterms would be a mistake, he argued. "I think if we waited until after the election, it would actually liberate some of the Democrats who now feel under the gun," he said. "So my preference is, let’s get her done by Oct. 1. If it slips a little bit, gets closer to the election, I think this is going to be one of the things that unifies our voters and energizes them and this is just one ... it’s not the last one. I hope President Trump gets at least one more during his first term of office."